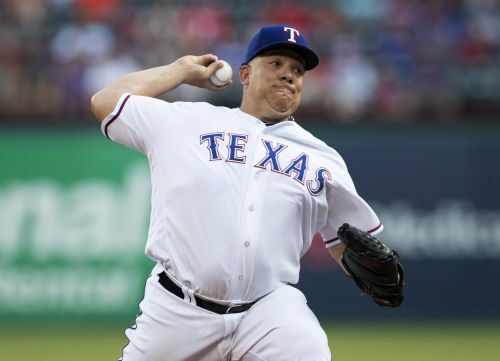 ARLINGTON, Texas (AP) — Bartolo Colon has always admired Hall of Fame pitcher and fellow countryman Juan Marichal. Rangers reliever Jose Leclerc came on with two on and no outs in the eighth, and the A's didn't score. He has allowed only one of 23 inherited runs to score. Right fielder Nomar Mazara threw out Davis trying to score on Mark Canha's single for the last out. "The difference for him is the calmness, the confidence and pounding the strike zone with all of his pitches," Banister said. "His confidence continues to ramp up." Oakland has homered in 19 consecutive road games, two short of the club record. ... The A's have played six games in a row without an error, their longest streak this season. Athletics: OF Matt Joyce, who hasn't played since leaving in the fifth inning of Saturday night's game at Kansas City, was put on the 10-day DL with a lower back strain. ... OF Stephen Piscotty didn't play after coming out of Tuesday's game early with left quad soreness. Rangers: 3B Adrian Beltre was out of the starting lineup for the second time in six days since coming off the DL (left hamstring strain) for the second time this year. "Just easing him back into it," Banister said. Athletics: Oakland is back home Thursday to start a 10-game homestand. RHP Frankie Montas (2-0) goes against Kansas City. Rangers: Cole Hamels (3-5), with a 2.89 ERA his last seven starts, pitches for Texas on Thursday night in the opener of a four-game home series against Houston. The lefty threw six scoreless innings against the Astros on May 11.